This work examines the Type 57 Grand Prix cars, the creation of Jean Bugatti, Ettore’s eldest son. The late Hugh G Conway wrote in Bugatti – Le pur sang des automobiles, that, after 1935, Bugatti’s racing programme became involved and very confusing to the humble historian, without accurate factory records. The T57G’s story is complex and has taken more than forty years to draw together, study and evaluate. Revealing new material, Tomlinson takes the view that existing records can be reinterpreted with a revised mindset, challenging conformist beliefs and dismissing many conventions. The book describes the 57G’s racing career and evolution through its siblings, the Types 57, 57S and 59. Type 57G characteristics are identified, with race-to-race body and chassis details described, and the Type 57G, 57S45, 57 "Sport" and 57C Le Mans cars are defined, and their enigmatic history revised. 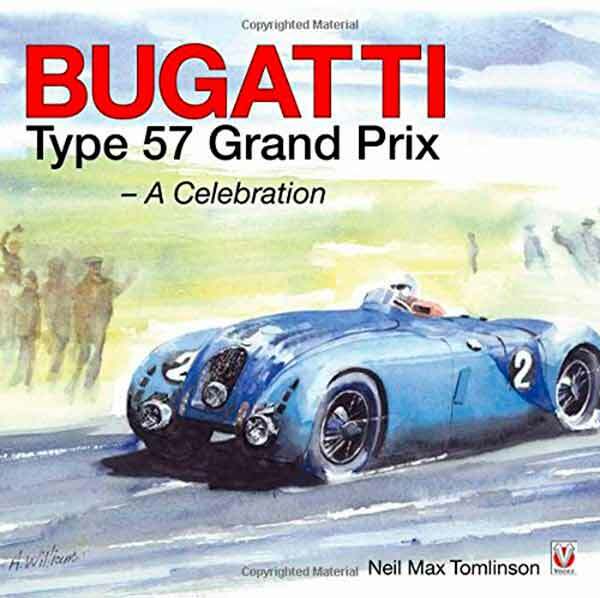 This book celebrates the Bugatti T57 Grand Prix racing cars: their origins, triumphs, failings, trivia, trinkets, and a little about the personalities behind them, interwoven with the social and political influences of those times. 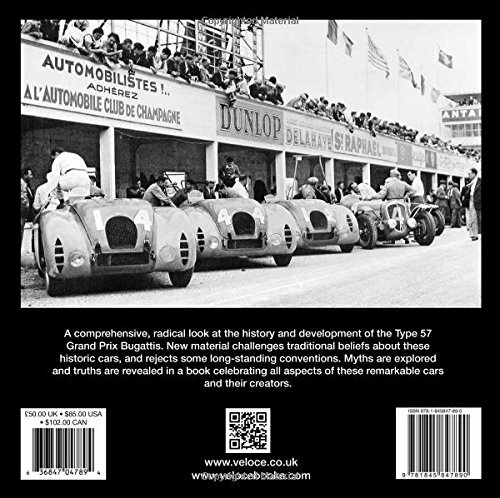 This book details the Bugatti Type 57 Grand Prix sports racing cars, essentially the most reliable and fastest competitors of their time. Includes many previously unpublished factory drawings and photographs, and describes all the detailed body and chassis changes from prototype, and from race to race. With new and previously unpublished information, it provides a convincing final argument that there were originally four T57G 'Tanks' built, the prototype being written off following a crash at Montlhery. It provides the latest information about the enigmatic Type 57S45 "Tanks", and the most up-to-date information about the 1939 Type 57C Le Mans winning car. It challenges conventional Bugatti history by showing that the "King Leopold car", 57248, is a Type 57G, not a Type 59, and it discusses the evolution sequence and developmentof the Type 57 Grand Prix cars from 1934 to 1939. Also disscussed are the myths and rumours surrounding the cars, with convincing for and against accounts. It discusses the final months leading to Jean Bugatti's fatal accident, Ettore's plan to re-locate the factory to Belgium, and dismisses the notion that Jean committed suicide. The book illustrates many of the toys and miniatures of the T57G made by manufaturers to celebrate the cars from 1937 to date. It discusses race results, analyses, and political events. There is a parallel with the Atlantic even, where this book does not proof the existence of a fourth Atlantic, but certainly of a 4th T57G ! Well worth a thorough read, and yes, I will continue also! To the Veloce site to order.